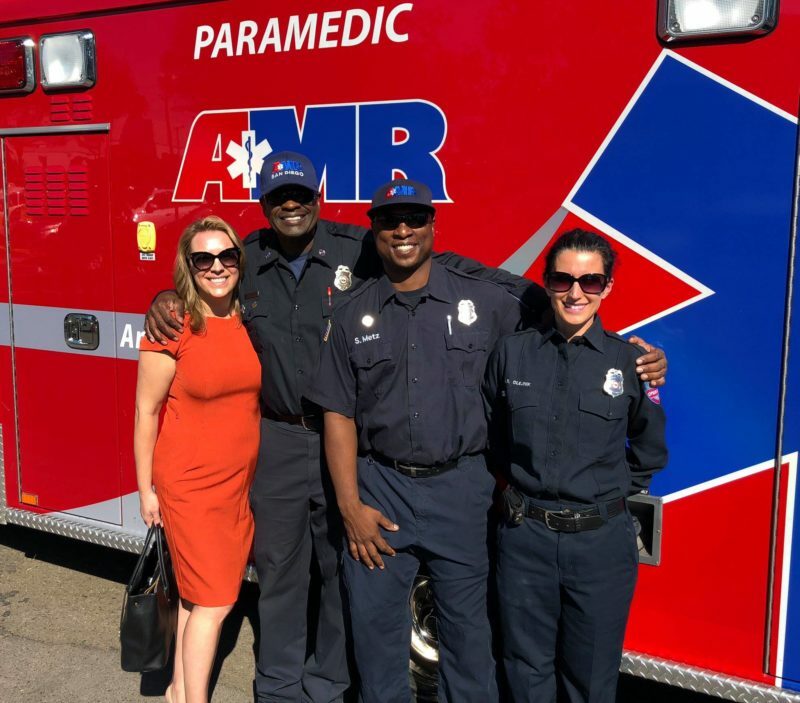 AMR responds to more than 200,000 emergency medical transports annually in San Diego County. Shown here are AMR’s Madeleine Baudoin, Ennis Jackson, Stephen Metz , and Loralee Olejnik. To that end, AMR is among a number of organizations partnering with the nonprofit Safe Homes Coalition to spread the word about safely disposing of prescription drugs. A kickoff event and press conference for the “San Diego 2019 Keep Kids Safe Program” will be held at 9 a.m. Saturday, April 6th at the San Diego County Administration Center at 1600 Pacific Highway in downtown San Diego. The kickoff event will rally volunteers to canvass San Diego neighborhoods, distributing U.S. Drug Enforcement Administration-compliant bags and envelopes to collect expired and unused medications. The pre-paid postage envelopes can be mailed anonymously to a DEA-compliant disposal facility in Texas to be weighed and then incinerated, or the bags can be brought to any number of approved drop-off locations throughout San Diego County. Volunteers will provide a list of drop-off locations such as pharmacies and law enforcement offices. The press conference will include remarks from San Diego County Supervisor Kristin Gaspar, San Diego County Sheriff Bill Gore, Confidential Recovery CEO Scott Silverman, and representatives from AMR, the Greater San Diego Association of Realtors, and the San Diego County District Attorney’s office. According to the Safe Homes Coalition, prescription drug abuse impacts more than 6 million Americans. Yet many people don’t know what to do with their old prescription medications, so they leave them unsecured in their homes. The medications can be too easily discovered by young children and curious teens, pets, and thieves. Realtors have found that open houses can be targets for prescription drug thieves; they pose as interested home buyers then go through medicine cabinets when no one is looking. Silverman, whose outpatient program Confidential Recovery helps adults dealing with drug and alcohol addiction, said doctors and medical insurance companies have taken more precautions to limit access to prescriptions that could be abused amidst a national opioid crisis. Opioids are a class of drugs that include illegal narcotics like heroin but also potent painkillers that are legally available by prescription such as fentanyl, oxycodone, hydrocodone, codeine, and morphine. Meanwhile, someone who was prescribed a powerful painkiller for an injury or post-surgery might not realize that the forgotten bottle in their medicine cabinet could fall into the wrong hands. “People think to hide their money and jewelry, they don’t think about this,” Silverman said. 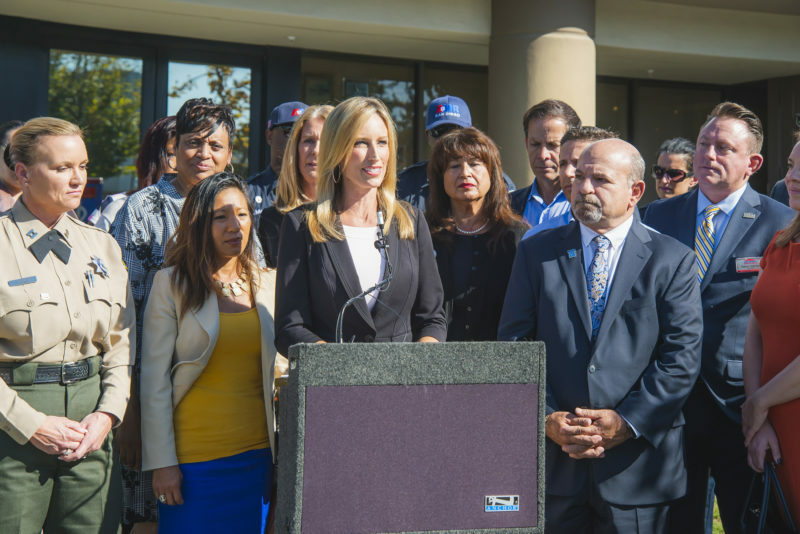 San Diego County Supervisor Kristin Gaspar (center) has given her support to the San Diego 2019 Keep Kids Safe Program, including funding to purchase 10,000 the postage-paid envelopes for the safe disposal of prescription drugs. The San Diego County Board of Supervisors has lent its support to the Safe Homes Coalition’s prescription drug disposal effort, particularly as the San Diego County Prescription Drug Abuse Task Force reports a steady year-over-year rise in unintentional drug-related deaths in the region. Prescription drugs and heroin killed 359 people combined in San Diego in 2017, according to county statistics. Supervisor Gaspar’s office has provided $100,000 to the San Diego 2019 Keep Kids Safe Program to purchase 10,000 of the postage-paid envelopes. For more information on the San Diego 2019 Keep Kids Safe Program kickoff event, go to makeitasafehome.org. Volunteers are encouraged to sign up online.